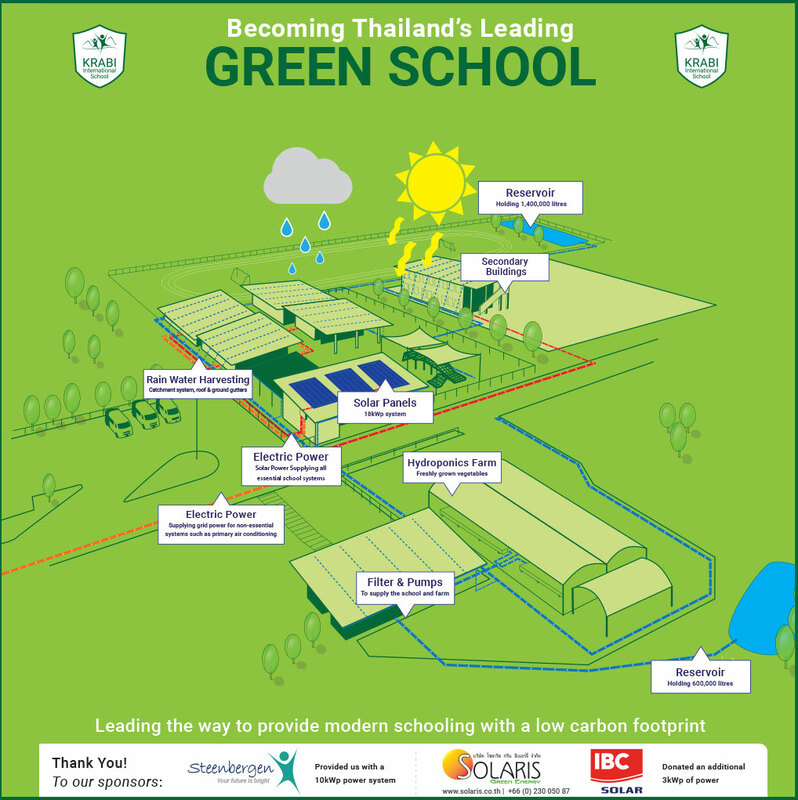 Leading the way to provide modern schooling with a low carbon footprint. 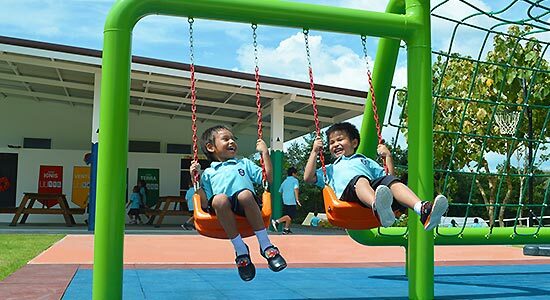 The earliest visions of Krabi International School were to be a self-sufficient school and to work together with our environment as much as possible. We have a mission to become a modern green international school with an initial goal to become fully self-sufficient within 5 years of opening. Now after only 3 years we are already close to accomplishing that goal and therefore want to take green schooling to the next level by heavily mixing in technology and innovation into the heart of our school vision. Schools are often the centre of the local community and we want to take this a step further to be able to literally provide power and organic produce to the surrounding areas. With the help of some amazing people we are already well on the way to this heightened vision. In April 2017, the Steenbergen family of New York partnered with us to aid the installation of our first Solar Energy power system. 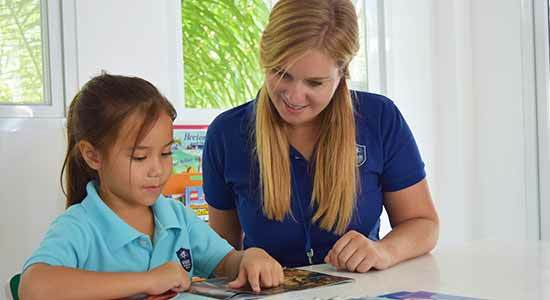 As part of this partnership, Krabi International School has opened up another place in the Steenbergen Scholarship program to educate, free of charge, a local Thai child. 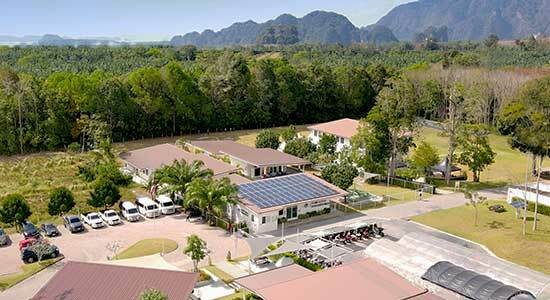 With the installation of more than 18kWp of solar panels we can say that we are possibly the first International School in Thailand to use the Sun as its main power source, to be a solar powered school. Initially the Steenbergen family of New York have provided us with funds to purchase and install a 10kWp power system and Solaris Green Energy in conjunction with IBC SOLAR an additional 3kWp system. We have increased that initial 13kWp to a total peak power system of 18kWp. Due to our school hours we can produce far more power over a year than we use. Currently our solar power is predominately used to power essential systems within the school and our new invertor driven air conditioning systems. Grid power is only used to power non-essential and very high load items such as our older non-invertor air conditioners. Once legislation allows we will work with the authorities to modify our system to allow any excess power to be feed back into the grid. As we are based in the tropical country of Thailand we have an abundant amount of rain fall and even during the dry season we have the occasional downpour. We aim to catch and use this rain! 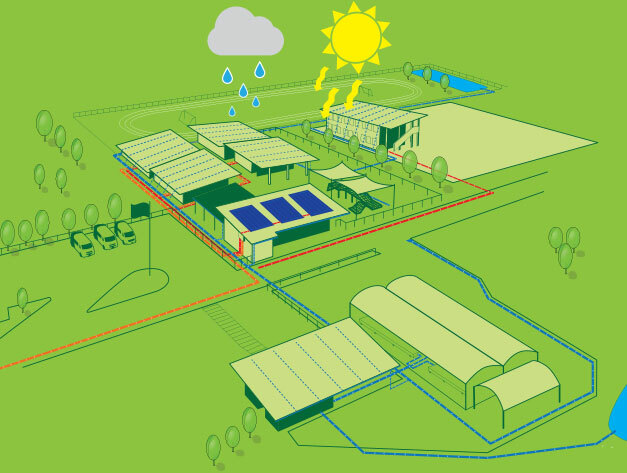 All over the school grounds there is an elaborate network of above and below ground catchment systems using roof and ground gutters, French drains and underground piping to redirect the majority of our rain water into a main underground pipeline that feeds into the main storage reservoir next to our sports pitch. The main storage point for the rain water will be the 1,500,000-litre reservoir situated at the end of the sports pitch at the lowest point of our property. Additionally, we have a 600,000-litre reservoir higher up on the property that supplies, via gravity to whole school. The main lower reservoir, once complete will also be populated with fish to help provide nutrients to the water within its own small ecosystem. This nutrient rich water will help irrigate our farm areas and provide water to our hydroponic farm with the aim to become truly organic. 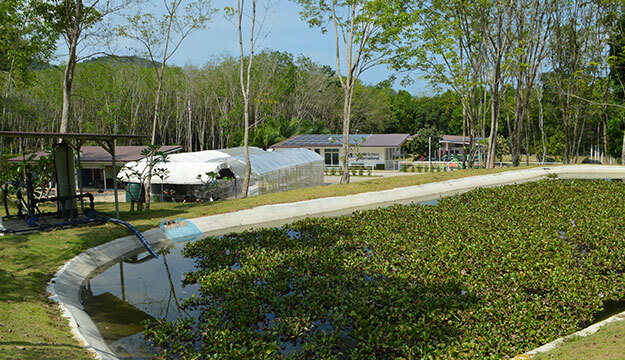 During the day, a solar power pump slowly but constantly pumps water up to the top reservoir. A basic particle filter removes any solids before going into the top reservoir and from there the water either goes in raw form for general irrigation or to the hydroponic farm. At the same time the water takes another route through filter systems so it can be used within the school. Further micro filtering and treatment brings this water to a safe drinkable standard. 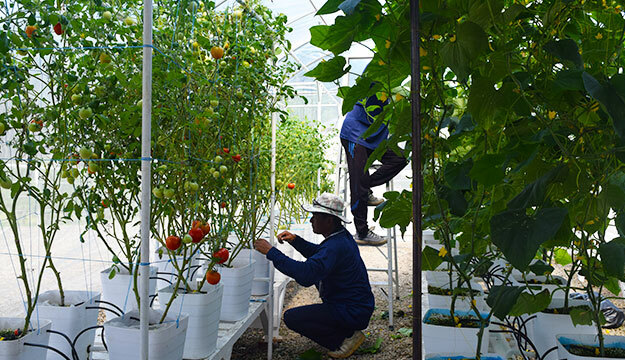 Hydroponic farming reduces water usage by 80% over conventional farming. We are currently experimenting with NFT (Nutrient Flow Technique), Flood and Fill, and Bato Bucket systems. Our first vegetables have been tomatoes and we are now starting lettuces, cucumbers, peppers, chillies, egg plants, potatoes, onions and carrots. Once fully operational we will be able to supply our staff and students with freshly grown organic vegetables. Excess vegetables will to available to parents and visitors to purchase in the school Café. This is a general mindset within the school. All of our staff and teachers are encouraged to reduce the use of paper, water and general resources. As the students get older the need to use paper reduces dramatically, and our interactive projectors and online learning tools are used more and more. We have a recycling centre for our rubbish and when purchasing goods we refuse plastic bags. We are constantly looking for new ways to be more environmentally friendly. We have a large area of land put aside for plant life that benefits the school and nature. Our choice of what to grow there is driven by education and food requirements. We are also in the process of making paths through the orchard to allow it to be used as a cross country running track. The old rubber trees in this area are slowly being replaced with various beneficial plants such as fruit trees and the wood from the old rubber trees is being used to manufacture frames and stands for the hydroponic farm area. For every rubber tree reprocessed we plant at least 2 new trees. Our buildings are designed with energy efficiency taken into account at every step. The position of the buildings in relation to the movement of the sun and the overhang of the roofs mean that at no point during the year does direct sunlight enter a classroom window during the school day. This is possible even with wide and tall windows that fill the classrooms with natural light. Air conditioning is available in all classroom however it isn’t used very often as we have 9 inches of high efficiency insulation in the roof space that prevents the heat of the sun warming the classrooms. This insulation also plays a part when air conditioning is used as it helps to keep the cool air in the room by reducing its upward flow. It is our responsibility to give our students and everyone around them the knowledge with environmental education to take this mindset forward and further develop it by using new technology and becoming more in-tune with our surroundings and planet. It is our job to teach our students holistically about everything in life; and looking after this planet, the place where we live, is very much part of that!